A series of assertions in a recent Wall Street Journal (WSJ) article regarding putative dissension between the Air Force and Navy over responsibilities for precise timing — a key element in GPS operations — has drawn a pointed rebuttal from the superintendent of the U.S. Naval Observatory (USNO). The August 1 article by Julian Barnes, headlined “Branches of the Military Battle over Shrinking War Chest,” cites a variety of examples supposedly illustrating competition for funds among Department of Defense (DoD) services in Washington’s deficit-minded environment. Among the examples cited by Barnes was the following: "There is also the matter of the master clock. The Navy maintains some 80 atomic clocks, many of them at the U.S. Naval Observatory in Washington, D.C. One of the most important uses of the master clock is to provide a time reference for the Global Positioning System. The Air Force, which has its own atomic clocks, argues it should take over the job of keeping time, since GPS relies on satellites. The Navy, which has been the U.S. timekeeper since 1845, objects." The next day, Capt. Tim Gallaudet, the USNO superintendent, wrote to the newspaper in an effort to correct what he called “several errors” in the article. These included the number of atomic clocks maintained by the Navy — 100, not 80; who owns the atomic clocks at Schreiver Air Force Base that support the GPS Master Control Station — the Navy, not the Air Force; and that the Air Force wants to take over time-keeping responsibilities. “Air Force officers who have the authority to make this position, including the Vice Commander of the Air Force Space Command, LGEN John Hyten, and the Chief Information Officer of the Air Force, LGEN Michael Basla, have recently met with me and personally confirmed the Air Force’s support for the U.S. Navy operation of the Master Clock,” wrote Gallaudet, who assumed his current post in September 2011. Although the WSJ has not yet published the letter or any correction to the article, Gallaudet shared with Inside GNSS a copy of the letter in which he also took issue with the reference to the newspapers reference to Navy objections to an Air Force argument for assuming the role of DoD timekeeper. “As the officer in the navy responsible for DoD timekeeping, I have never heard of any official or unofficial Air Force position to take over DoD timekeeping, therefore I have never had the opportunity to ‘object,’” he stated. Buttressing the U.S. Navy’s DoD timekeeping mission, Gaulladet referenced the U.S. Code, instructions signed by the Chairman of the Joint Chiefs of Staff, DoD directives signed by the DoD chief information officer (CIO), and instructions signed by the deputy chief of naval operations. The directive also names the USNO superintendent as the DoD’s PTTI manager, responsible for coordinating all DoD PTTI operations. These include maintaining the master time and frequency standard for the DoD and “the underlying timing reference for coordination of all U.S. Government PNT systems. GPS system time is computed by the GPS control segment using an assembly of clocks — the GPS Composite Clock, which consists of all operational monitor station and satellite frequency standards. GPS system time, in turn, is referenced to the U.S. 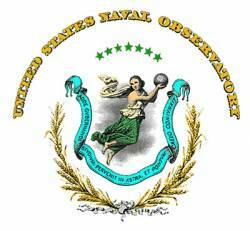 Naval Observatory’s Master Clock and steered to Coordinated Universal Time — UTC(USNO), corrected for leap seconds (which GPS time doesn’t use). 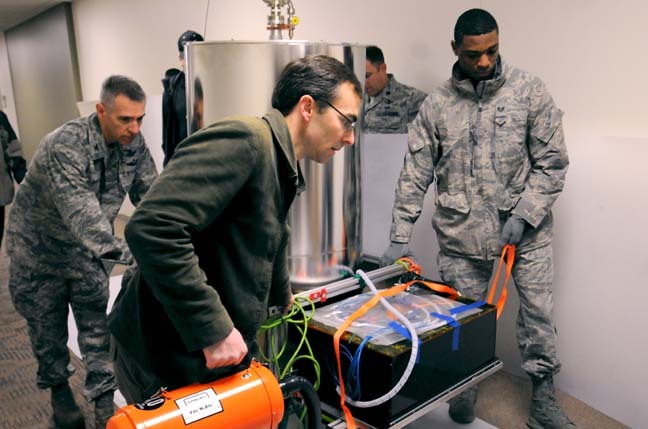 Last December, the first of three rubidium fountain clocks arrived at Schriever AFB from the USNO to upgrade the alternate master clock maintained at the base. "The relationship between the USNO and the 2nd Space Operations squadron is symbiotic," said Lt. Col. Thomas Ste Marie, 2 SOPS commander. "USNO maintains Universal Time using a myriad composite of atomic clocks both in Washington D.C. and here at Schriever AFB,” Ste Marie added. 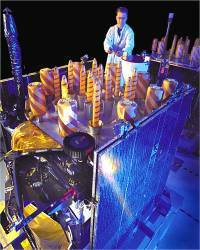 “In fact, each GPS satellite and monitor station is a contributor to this composite clock. The GPS constellation broadcasts that time to billions of users worldwide. It’s both this technical relationship and solid organizational partnership that allows for continually record breaking time-transfer performance and navigation accuracies." GPS uses an internal timing system derived from USNO clocks that steer its timing accuracy. Specifications state that users must be able to obtain a time-transfer accuracy to UTC within 40 nanoseconds. According to Ste. Marie, the actual accuracy at Schriever has routinely been below 4 nanoseconds. "The arrival of this clock marks a quantum leap in the accuracy of the U.S. Naval Observatory’s Alternate Master Clock, which continually provides the world with precise timing via the Global Positioning System," said Col. James Ross, 50th Space Wing commander. "We are pleased to help our mission partners from USNO realize this significant upgrade."